The Titans return in their new form which is noticeably missing Cyborg and Starfire’s boo, Beast Boy. The issue starts with readers immediately meeting Kid Flash, an over eager glory hound who speeds to the aid of a group of fire fighters who don’t really need assistance. Causing a back-draft, he makes the small fire into a raging inferno. Enter Red Robin who is monitoring superhero news stories. He is accosted by a mysterious group who call themselves NOWHERE Escaping them he tracks down Cassie Sandsmark (Wonder Girl) and saves her from a similar fate. They team up and we are transported to the NOWHERE headquarters where the mystery man who accosted Red Robin makes the decision to unleash…THE SUPERBOY! The story is interesting as first issues go. 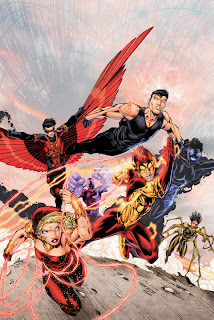 And I think that this will be an interesting take on the Titans. The cover shows at least three people that I don’t recognize so I am interested and excited to see who they are and how they play into the team. The art by Brett Booth is pretty solid on this one. I dig the way most of the people look is pretty cool, minus the spider lady on the cover who I think looks just little ridiculous).One thing I’ve noticed in most of the New 52 books I’ve read is that the women don’t look like barbies with volleyballs glued to their chests, of which I approve. Overall an interesting character development and a promising story lends itself to this first issue, and I can say that Teen Titans is officially on my list of books to pick up in October.